GC TMNT: Mutant Melee (USA) "100%" in 2:42:38.18 by Dimon12321. TMNT: Mutant Melee (released as Teenage Mutant Ninja Turtles: Mutant Melee in PAL regions) is a 3D fighting game based on the 2003 animated series. 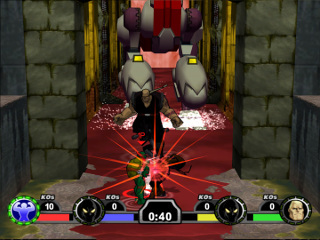 Whilst the combat system is similar to previous games based on the same series, TMNT: Mutant Melee is more arena-focused. Here, author Dimon12321 presents a tool-assisted, shell-raising journey through all 170 levels of the game's Adventure Story mode.